Cooking with Amy: A Food Blog: Do You Need a Kitchen Scale? I never understand when people say they can’t cook. If you can follow a recipe, you can cook. Although not every recipe yields great results. One problem is accuracy. In creating recipes for clients I generally measure and weigh ingredients. Weighing is always more accurate. So it makes sense that when following recipes with weights, that readers should use weights too. Of course not all recipes are written with weights, but that's changing. Some prominent cookbook authors, especially bakers, are using weights in their recipes and in particular the metric system. 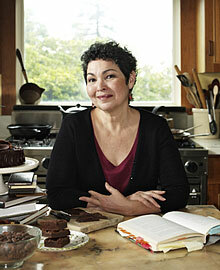 I talked to once such baker and cookbook author, Alice Medrich. She collects James Beard awards for practically every book she writes and approaches recipe testing much like a scientist. Her latest books are Flavor Flours and Seriously Bittersweet, Here’s what she had to say about using scales. 1. When did you start using grams in your recipes? I got used to grams in Europe in the 1970's. 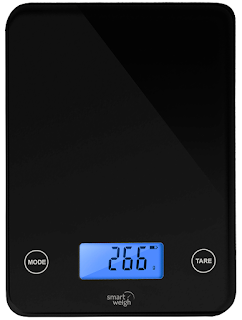 I didn't switch from ounces to grams in my books until just a few years ago because I began to see that people were warming up to using scales and while they were at it, I thought, why not get them onto grams? I also saw that some of the celeb chefs were publishing in grams, so I though that would help too. 2. Why grams versus ounces? If you want to increase or decrease a recipe by any percentage, the math is so much easier to do in grams. If you make small changes in a recipe by increasing certain ingredients by small amounts, it's easier to capture that amount in grams than fractions of ounces. Grams are universal around the world (except for in the US), so you can reach a wider audience and you can also use recipes from books around the world without worrying about the "translation." Grams are such small units that you rarely need to use fractions which you do have to do with ounces. This means that grams look cleaner on the page. With grams its easer to see relationships and ratios between amounts of ingredients. 3. What do you look for in a scale? It should have a switch that goes from ounces to grams. It should have a tare button (so you can reset to zero) to compensate for any kind of container. It should be able to register amounts at least as small as 5 grams (though I like a scale that reads 1 or 2 grams) and at least as high a 2 kilos (though more is better). I DO NOT LIKE any scale that proposes to translate from volume to weight (first because I don't trust the weights used for equivalences and second because I think we are grown ups and can learn to use a scale without training wheels) I often say that a decent scale can be had for less than the price of 10 lattes....so there is really no excuse not to have one, especially if you like to bake. I’ve reviewed various scales over the years. My current model? Smart Weigh. Disclaimer: I received the Smart Weigh for review purposes. This post includes Amazon affiliate links. I was not monetarily compensated for this review or any other post.